In Medieval Limerick, there were five parishes in Limerick City; St John's, St Mary's, St Michael's, St Munchin's and St Patrick's. St Mary's was divided into St Mary's and St Nicholas' (1991). St Michael's was divided into St Michael's, Our Lady of Lourdes (1963), St Joseph's (1973) and St Saviour's (1973). St Munchin's was divided into St Munchin's, Our Lady of the Rosary (1964), Christ the King (1970) and Corpus Christi (1976). St Patrick's was divided into St Patrick's, Monaleen (1971), and Our Lady Help of Christians (1981). St John's parish has not been altered. St Paul's was formerly part of the parish of Mungret/Crecora and was created in 1971. Our Lady Queen of Peace (1961) and Holy Family (1970) were formerly part of the parish of Donaghmore/Knockea. 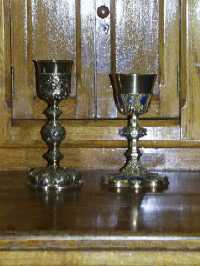 In St Mary's church, there are a number of interesting chalices that date from the seventeenth century. 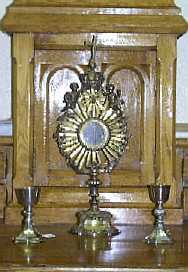 The oldest chalice in the church dates from 1652 and is the Meade chalice. This chalice is associated with the Dominican Order in Kilmallock and the inscription is in Latin, which states that "Bro. Dominic Meade had this chalice made 3rd April 1652". The Lacy chalice is dated as 1662 and the inscription states that "Fr Thomas Lacy got this chalice made for Dr Edmond Lacy". The third chalice worthy of a mention was stolen from the sacristy by two drunken British soldiers and broken. Later it was found and repaired by Dr Casey PP in 1873.